The sluggish return of jobs during the economic recovery may be due, in part, to the slower-than-expected spending of stimulus money. Most states lag behind in getting started on the local level, and much of the state spending has not gone into programs that actually create new jobs. Another big chunk went to transportation infrastructure spending. This was supposed to hold more promise for new jobs because the Recovery Act's "maintenance-of-effort" requirement is designed to prevent states from substituting federal funds for state funds already allocated for projects. However, the GAO said that has "proven to be challenging." Many states haven't completed a maintenance-of-effort certification that the DOT accepts. Given the states' financial challenges, it has proven very tempting to use those funds to balance their own budgets, rather than for brand new projects. 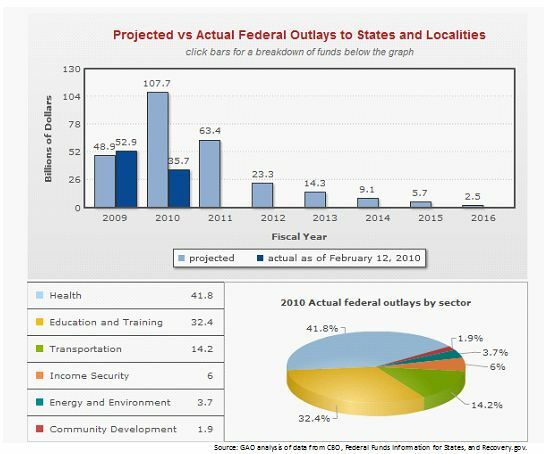 Source: GAO analysis of data from CBO, Federal Funds Information for States, and Recovery.gov. You can track reporting of government stimulus spending on the General Accountability Office's Website here.